Probiotics act on in the digestive tract, but their effects are still systemic. You've read about the anti-weight gain effects of probiotic supplements in rodents before at the SuppVersity and in the SuppVersity Facebook News. Nice, yes, but will this also work in human beings? If we put faith into the predictive quality of a recent from Virginia Tech, it should. Before we delve deeper into the study design, results and evaluation in the bottom line, I'd yet like you to know that (a) we don't know if the effects will persist for more than 4-weeks, if they will become stronger or weaker and that (b) the study was funded by VSL Pharmaceuticals (Osterberg. 2015) - both additional reasons not to confuse a single study like this with "proof" that probiotics block fat gain. The objective of Osterberg's latest study was to "determine the effects of the probiotic, VSL#3, on body and fat mass, insulin sensitivity, and skeletal muscle substrate oxidation following 4 weeks of a high-fat diet" - in humans, and even better in 20 non-obese men (18-30 years) who participated in the study. "All testing took place at the Human Integrative Physiology Laboratory between the hours of 5:00 and 11:00 am. Participants fasted for 12 h, did not consume caffeine or alcohol, performed no vigorous physical activity for the prior 48 h, and were free from acute illness for the prior 2 weeks. 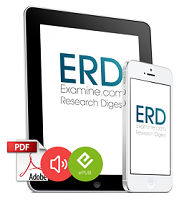 [...]Following a 2-week eucaloric control diet, participants underwent dual X-ray absorptiometry to determine body composition, an intravenous glucose tolerance test to determine insulin sensitivity, and a skeletal muscle biopsy for measurement of in vitro substrate oxidation" (Osterberg. 2015). Subsequently, participants were randomized to receive either VSL#3 (2x450 billion bacteria), a dietary probiotic supplement that contains a motley mix of bacteria, i.e. Streptococcus thermophilus DSM24731, Lactobacillus acidophilus DSM24735, Lactobacillus delbrueckii ssp. bulgaricus DSM24734, Lactobacillus paracasei DSM24733, Lactobacillus plantarum DSM24730, Bifidobacterium longum DSM24736, Bifidobacterium infantis DSM24737, and Bifidobacterium breve DSM24732, or placebo daily during 4 weeks. 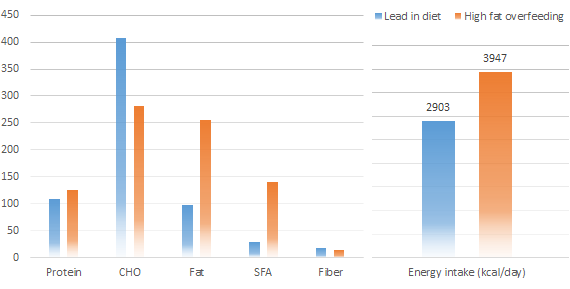 Figure 1: Composition (in g/day) and energy consumption (kcal/day) of the lead in and high fat diet (Osterberg. 2015). Both, i.e. the probiotic supplement VSL#3 as well as the placebo supplement, were consumed alongside a high fat milk shake which also served to bring up the total energy intake (+1,000kcal/day) and relative contribution of fat from 8% to 55% compared to the standardized diet that was used in the 2-week lead in. Practically speaking, we are thus looking at a standardized high fat overfeeding study with or without probiotic intervention. Figure 2: Changes in body composition in response to 4-week high fat overfeeding with or without probiotic supplementation (VSL#3, a 900 billion multi-strain probiotic) in 20 normal-weight young men (Osterberg. 2015). A study that yielded interesting results, but results that are of questionably practical relevance. 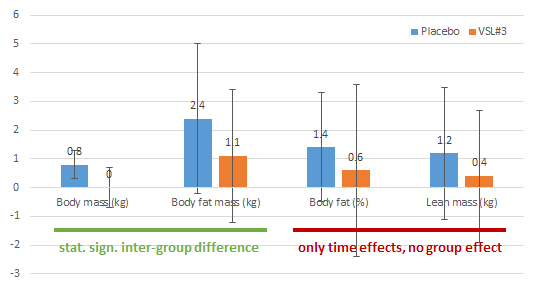 Yes, there was a statistical group effect for the changes in total body mass (0 kg vs. 0.8kg) and the total body fat mass (+1.1% vs. +2.4%). Since there were neither significant differences in body fat% due to the lower lean mass gains in the probiotic group and considering the fact that there were no additional health effects in form improvements in insulin sensitivity or fat oxidation. Since neither of them was affected by the overfeeding, anyways, the significance of the lack of change is questionable. Bottom line: In spite of the statistically significant weight and fat gain differences, the interpretation of the study at hand is not 100% straight forward. This may be due to the fact that within only 4 weeks other changes (esp. health relevant parameters) did not occur in either group. While this study shows no immediate health benefits, there's evidence that gluten sensitive individuals may benefit from supplementing /w certain strains. Furthermore, it must be said that the reduced lean mass gains in the probiotic strain and the subsequent lack of changes in body fat percentages, suggest that the amelioration of the subjects' weight gain is mediated by a mere reduction in energy-availability (this assumes that the intakes in both groups were identical to begin with). If this is the case, the supplement still has its merits: According to the questionable approximation that says that it takes 7,000kcal extra to gain 1kg of body fat, the probiotic supplementation would have compensated for 1.3 kg x 7000 kcal/kg = 9100kcal over 4 weeks and 325 kcal/ day (note this is not a scientifically accurate calculation). Still, much more research is going to be necessary - not only to elucidate the exact mechanism, but also to find out if the effect might depend on the type of diet: A high fat diet, for example, has been shown to have significant, potentially detrimental effects on the human gut microbiome, which may be meditated by the bile acid resistance of several strains of bacteria, i.e. more fat = exuberant bile production = death to many good bacteria (David. 2014) | Comment on Facebook! David, Lawrence A., et al. 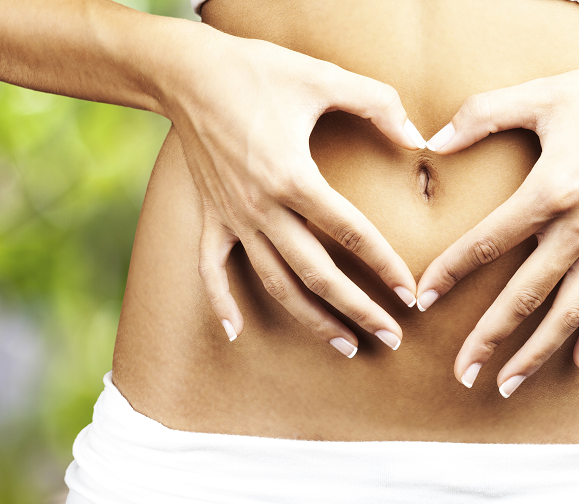 "Diet rapidly and reproducibly alters the human gut microbiome." Nature 505.7484 (2014): 559-563. Osterberg, et al. "Probiotic Supplementation Attenuates Increases in Body Mass and Fat Mass During High-Fat Diet in Healthy Young Adults." Obesity (2015): Ahead of print.